When he saw the Speedmaster SX 52 Annicolor UV for the first time at drupa 2012, Siegfried Dorner, Managing Director of DORNER PrintConcept GmbH & Co.KG, knew immediately that this was just the right press for his business model. 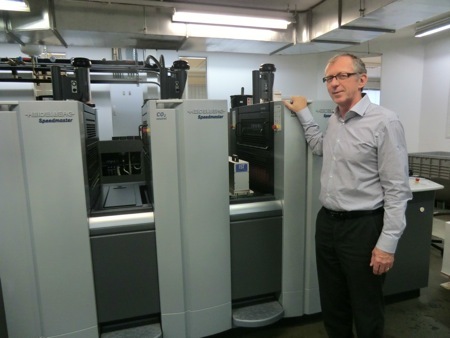 Since summer 2013, the print shop in Sulzbach-Rosenberg has been running a Speedmaster SX 52 five-color Anicolor UV press with coating unit from Heidelberger Druckmaschinen AG (Heidelberg) - the first Anicolor UV press in Germany. "Straight away, I was impressed by the fast inking-up, diverse finishing options on a broad variety of materials, and dry sheets that can go straight into postpress," says Dorner. It was ten years ago that he took over the company, which was established in 1919, and since then he has been utilizing his 30 years-plus experience in the mailing sector for his print products. "The most important feature of a direct mailing is its ability to grab attention in the very first seconds using the right type of coatings and special effects, such as high gloss, spot coatings, and die-cutting," explains Dorner. "The Speedmaster SX 52 Anicolor UV gives us the best opportunities to design print products that really stand out from the crowd. And with low paper waste of much less than 100 sheets per order, we're also looking after the environment and running production cost-effectively. We save a good deal of money, particularly when working with expensive materials such as film." Outstanding quality results can also be achieved on uncoated papers. Thanks to short makeready times, the Speedmaster SX 52 Anicolor UV is ideal for the growing number of print jobs that involve short runs and frequently changing print motifs, but it is just as suitable for longer runs, too. DORNER PrintConcept is a full-service print shop that employs 50 members of staff, including trainees, and specializes in mailings and letter shop services. It also produces classic advertising materials such as flyers, brochures, and business stationery. Short and medium-sized runs are particularly popular for mailing jobs, for example the frequently updated catalogs issued by mail-order companies and personalized advertising campaigns for automobile dealerships. The print shop's customers from the industrial, trade, and advertising sectors are largely based in the surrounding region, but a number of its mailing campaign customers operate across the whole of Germany. "Thanks to the Speedmaster SX 52 Anicolor UV, we can complete inking-up very quickly - without ink zones or color presetting data - and achieve uniform inking, even with critical screens and solids," explains Dorner. "The fact the inks dry so quickly is crucial for personalization, because it means we can print data on the sheets with a laser printer and deliver the mailings in the shortest possible space of time." Print data normally arrives in the morning and the end products have to be ready for dispatch on the same day. Fortunately, rapid drying and improved rub resistance have eliminated complaints. "In the past, printing stock that didn't dry so well was a continuous source of problems in postpress," explains Dorner. The majority of print work is produced in four colors and often with gold and silver in the fifth printing unit. Drip-off, matt-gloss, and high gloss coatings are also offered. To ensure optimum results, the print shop uses Saphira UV inks and Saphira UV coatings, which have been precisely tailored to the screen roller technology of the Anicolor inking unit. "We used the Speedmaster SX 52 Anicolor UV to print a high-quality illustrated book on food that incorporated very fine screens and a lot of solid areas. We wouldn't have been able to do this on a conventional press and the advertising agency that gave us the order was impressed," recalls Dorner. To ensure he can always offer his customers a rapid service, Dorner has signed up to the Partner Program run by Heidelberg Systemservice and feels confident that he has made a sound investment in his company's future.